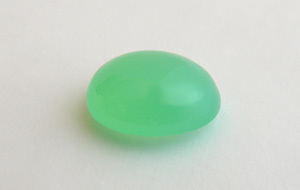 A green variety of chalcedony. The colour is caused by tiny inclusions of Ni-bearing layers silicates. 7 specimens: 0107 — 0.52 ct, no precise locality [Africa]; 0292 — 0.51 ct, no precise locality [Africa]; 0697 — 0.49 ct, no precise locality [Africa]; 0473 — 0.61 ct, no precise locality [Africa]; 0181 — 2.59 ct, no locality data; 0182 — 2.53 ct, no locality data; 0465 — 0.61 ct, no precise locality [Africa].